THE STAR METHOD - for Interviews - Boomer Technology Group, LLC.Boomer Technology Group, LLC. For those going on interviews try this: The STAR method (which stands for “Situation, Task, Action, Results”) is a behavioral interviewing technique that can be used to gain those insights. Interview questions using the STAR method urge candidates to tell a linear story, focusing on a specific situation and providing details regarding tasks and results. 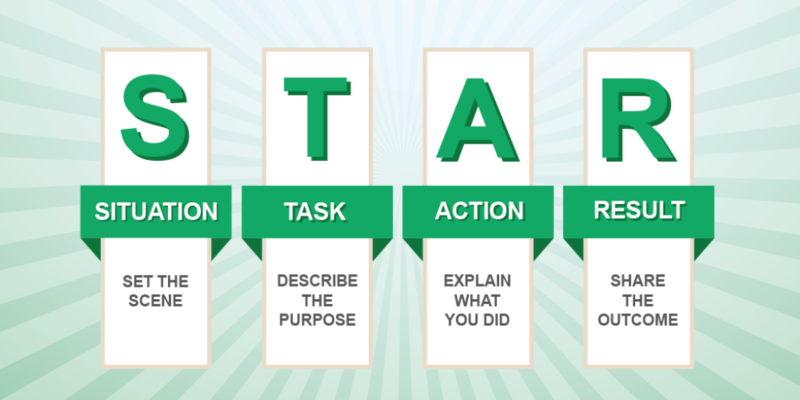 The STAR method is a structured manner of responding to a behavioral-based interview question by discussing the specific situation, task, action, and result of the situation you are describing. Result: Describe the outcome of your actions and don’t be shy about taking credit for your behavior. What happened? How did the event end? What did you accomplish? What did you learn? Make sure your answer contains multiple positive results. Make sure that you follow all parts of the STAR method. Be as specific as possible at all times, without rambling or including too much information. Oftentimes students have to be prompted to include their results, so try to include that without being asked. Also, eliminate any examples that do not paint you in a positive light. However, keep in mind that some examples that have a negative result (such as “lost the game”) can highlight your strengths in the face of adversity. Situation (S): Advertising revenue was falling off for my college newspaper, The Review, and large numbers of long-term advertisers were not renewing contracts. Task (T): My goal was to generate new ideas, materials and incentives that would result in at least a 15% increase in advertisers from the year before. Action (A): I designed a new promotional packet to go with the rate sheet and compared the benefits of The Review circulation with other ad media in the area. I also set-up a special training session for the account executives with a School of Business Administration professor who discussed competitive selling strategies. Result (R): We signed contracts with 15 former advertisers for daily ads and five for special supplements. We increased our new advertisers by 20 percent over the same period last year. • Recall recent situations that show favorable behaviors or actions, especially involving course work, work experience, leadership, teamwork, initiative, planning, and customer service. • Prepare short descriptions of each situation; be ready to give details if asked. 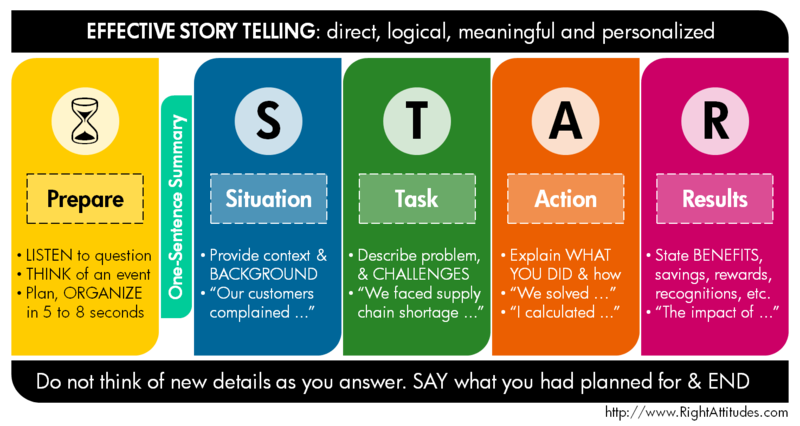 • Be sure each story has a beginning, middle, and an end, i.e., be ready to describe the situation, including the task at hand, your action, and the outcome or result. • Be sure the outcome or result reflects positively on you (even if the result itself was not favorable). • Be honest. Don’t embellish or omit any part of the story. The interviewer will find out if your story is built on a weak foundation. • Be specific. Don’t generalize about several events; give a detailed accounting of one event. • Vary your examples; don’t take them all from just one area of your life. • Describe a time when you were faced with a stressful situation that demonstrated your coping skills. • Give me a specific example of a time when you used good judgment and logic in solving a problem. • Tell me about a time when you had to use your presentation skills to influence someone’s opinion. • Tell me about a difficult decision you’ve made in the last year. • Tell me about a time when you delegated a project effectively. • Give me an example of a time when you used your fact-finding skills to solve a problem. • Please tell me about a time you had to fire a friend. • Describe a time when you set your sights too high (or too low). This entry was posted in Training Services and tagged STAR METHOD. Bookmark the permalink.